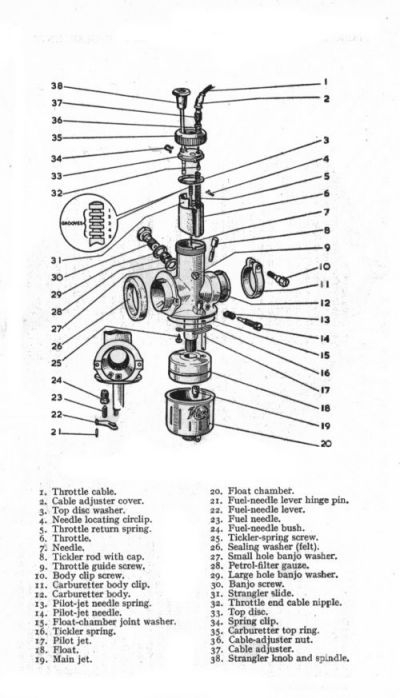 I think i have a type 22 carb that is missing a few parts, just looking at what options i have. it doesn't look 100% like the above but the closest i can find. The images below show a dented float, a pilot jet needle that just seems like a small piece of solid metal and any number of other unknowns. Do you think its possible to fix or should i be looking for another to replace? If so has anyone a spare working carb for a atco standard? A chat with George at Villiers parts or Paul at Meetens will be worth while. That's sounds expensive. Will try to replace the pin correctly and tinker prior to making the call. Thanks for the contact details. That type of float damage is often caused by water in the float bowl freezing and the expansion crushing it. Perhaps nothing to loose by immersing the float in boiling water in the hope that the air inside will expand and push out some of the crushed end. If you see a stream of bubbles emerging from the float it's a sign that it is leaking and it won't pressurise. Very helpful chap though, thanks for the name. Had a little play yesterday and the leaking seems to have stopped. Unfortunately the rain came so didn't have chance to fire up, hopefully it will hold off today.